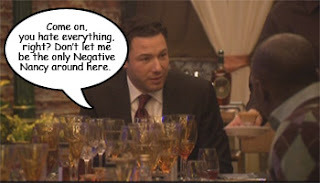 The premise of Rocco DiSpirito's new Bravo series, Rocco's Dinner Party, is "belittle the chef." 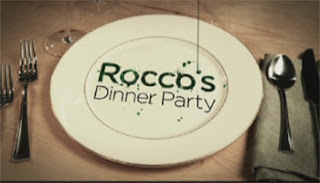 Honestly, Rocco, if you need to do that sort of thing to make yourself feel more important, then maybe you should re-examine some of your life choices (getting in bed with Jeffrey Chodorow, hawking cat food, selling your mother's meatballs on QVC, competing on Dancing With the Stars, and of course, desecrating brownies). Three chefpetitors (can't call them "cheftestants" now, can I?) - this week it's Geoff, Britt, and JJ - meet Rocco on an elaborate set that is supposed to be DiSpirito's loft. Not only does it have a huge kitchen, but also three separate dining rooms, each with a different theme. (Purina must pay well.) Rocco tells the three that he is having a dinner party and would like two of the chefs to create a multi-course meal for his guests, but first, an elimination challenge. Each chefpetitor must create a signature dish for Rocco's approval, one of which will not make the cut. Chef Geoff - who appears to have a huge zit on his right cheek - is a punster, making a dish with lobster and monkfish, also known as "the poor man's lobster." Chef JJ, a cocky young African-American, goes for something more familiar - scallops with corn and bacon. And finally, Chef Britt, the only gal in the group, decides that 30 minutes isn't enough time to cook anything so she takes a risk by making an Arctic Char tartare. This she plans to serve with lemon creme fraiche and an avocado puree that turns an unappetizing brown after a spin through the blender. Taking a page from the Top Chef playbook, Rocco comes into the kitchen to mock the chefs. He picks up a rather wan-looking lobster from Geoff's table and cracks, "don't you know we usually cook LIVE lobster?" He also makes a point to tell Britt that he's not in favor of raw Arctic char but doesn't explain why. Arctic char is so similar to salmon, methinks he's just being bitchy. Time is called and the three chefpetitors present their dishes to Rocco on the Altar of Judgement. He gives JJ a completely unnecessary verbal smackdown over his dish, sneering something to the effect of "Diver scallops, corn bacon - never heard of that before!" Chef Britt gets criticism for not actually cooking, and Rocco feels the need to point out yet again that he doesn't like raw Arctic char before admitting that her preparation actually tastes good. But of course that doesn't mean anything, since he's not sure if she knows how to heat up a pan and cook. Then he turns his disdain toward Geoff, whose monkfish is undercooked to the point of being raw. 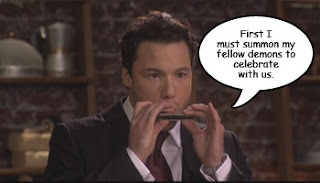 Apparently a yucky thing, at least to the refined tastebuds of Rocco DiSpirito. After excoriating the three thoroughly, he sends Britt packing. Chefs Geoff and JJ now have the task of creating food for a Speakeasy-themed dinner party. But first - decor. They consult with celebrity event producer Jes Gordon, who will provide thematic props for their chosen dining room. Geoff chooses the "terrace" room and a Chicago gangster theme replete with pinstriped linens, replica 20s automobile tablescapes, and bottles of hooch emblazoned with the guests' names. Chef JJ takes the "formal" dining room which he requests be transformed into a Harlem-esque speakeasy with a piano in the corner and harmonicas done up as place cards. The guests for this week's dinner party include such luminaries as Christine Ebersole and deposed Top Chef Masters host Kelly Choi. Oh, and Chef Marcus Samuelsson, adding a nice double-shot of Masters tie-in. 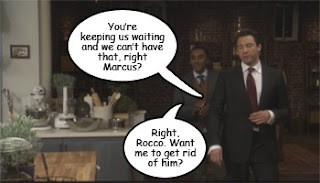 According to Rocco, Marcus owns an actual speakeasy. Oh really? Since when is New York City a dry town? Back in the kitchen, we find that Chef Geoff is serving first. He scrambles to assemble his five course meal in the four-hour time allotment. He's making a sweet potato soup, black cod, short ribs, and a creme brulée. But wait - there's a twist. 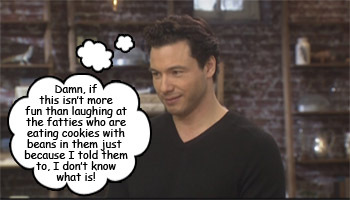 Rocco stops by to tell the chefpetitors that some of his guests have dietary restrictions. (And you know he knew all about these issues before the chefs went shopping, but it's not douchey enough to inform the chefs while they're planning their menus.) One is a vegetarian (of course) and one doesn't consume pork or alcohol in any form. In other words - he's no fun at all. The guests enter Geoff's dining room and marvel over the gangster-style decor. 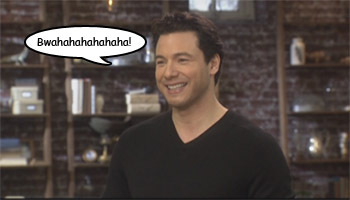 Food comes soon and generally everything is enjoyed, even by the Great Chef Rocco DiSpirito. That is, until they get to the fish course, when Rocco is convinced that Geoff doesn't know the difference between black cod and a hole in the ground. Then, adding insult to injury, the meat course is a bit late, causing a scowling Rocco to stomp off to the kitchen to see what's holding up the works. With this added stress, Geoff's zit gets so big and red I think it might really be a case of conjoined twin myslexia. The short ribs are well-worth the wait and everyone seems happy. Even the vegetarian, Christine Ebersole, who has been receiving alternate versions of every dish. Finally, the dessert comes out, topped with a cloud of spun sugar, and ends the party on a sweet note. Tossing their spent napkins on the table, the party guests go to the formal dining room where they ooh and ahh over the piano and fireplace. Guest Bill McCuddy says that this room is Saturday night, while the other room was Sunday afternoon. 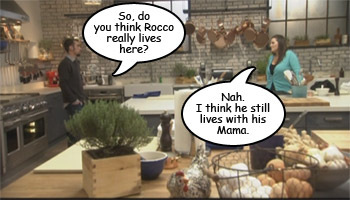 After only one dish, shrimp with overcooked grits, Rocco feels the need to make JJ nervous in the kitchen. This time Marcus comes in with him to up the ante. The entree that comes out of JJs kitchen is braised oxtail, which he serves on the bone. Not everyone is familiar with oxtail, which used to be an ingredient for poor people. As guest Michael Kenneth Williams notes, oxtail has become an expensive luxury item these days. JJ's preparation is so delicious, Williams picks it up and starts gnawing on the bone. Kelly Choi is completely turned on. After both meals are concluded, it seems that Rocco has a hard decision to make. While both chefs chose a main protein that usually requires a very long cooking time, each produced moist meat that impressed the diners. Yes, moist meat is always more comfortable than dry meat. The two guests with dietary restrictions were also satisfied by both menus. However, there was a problematic dish on both sides - Geoff's cod and JJ's grits drew more complaints than compliments. Rocco goes back to the Altar of Judgement to proclaim the winner of this challenge. He pours two glasses of champagne, but before he hands one to the winner, he pulls out a harmonica and produces a couple of feeble toots. Geoff is sharp enough to realize that this means JJ is the winner and graciously congratulates him. JJ gloats. Makes me wonder if Rocco would have taken a swig of hooch from Geoff's bottles had he won the challenge. Thus concludes episode 1. How many more of these can I do without feeling dirty?